This is an easy and tasty meal that I made using all the ingredients I had in the pantry or the freezer. You can make it ahead of time so it is also good if you have visitors as a side dish or a main. Cook the chicken pieces and keep aside. Heat some oil in a wok and add the chopped onions and cook till they turn brown, and remove from wok. Allow the wok to cool slightly and mix the egg with the 3 drops soy and sesame oil. Add a bit of oil to the wok and add the egg, and turn the pan so it is a thin omelette. Turn and cook the other side briefly and remove from the wok. Chop into smaller strips when cooler. Heat some more oil in the wok and add the carrots and peas. Next, add the onion. Add the chicken and stir-fry for about 2 minutes. Add the rice, spring onions, and bean sprouts, tossing them to mix well, and stir-fry for about 3 minutes. Add 1 or 2 tbsp soy sauce and the chopped egg omelette pieces and fold in. Cook for a minute and serve. 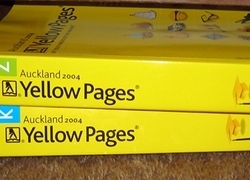 Do you ever still use the Yellow Pages and/or ordinary phone book now that we have Internet?